H.E Ms. Naghmana A. Hashmi is the Ambassador of Pakistan to the EU, Belgium and Luxembourg since June 2014. Born in 1960. Holds University degrees in English Literature, Political Science and advance language diplomas in French and German. Has edited and published several books including coffee table: Magnificent Pakistan, Ishq-Our Sufi Tradition, Les Cité Oblie de l’Indus (the forgotten cities of Indus) and the Social and Cultural History of Pakistan. Joined the Foreign Service of Pakistan in 1983. 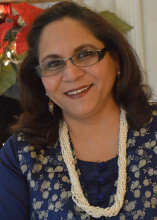 Held various diplomatic assignments in Pakistan Missions abroad: Paris (1987-1990), Jakarta (1994-1997), Copenhagen (1997-2000), Beijing (2003-2007) and served as Ambassador of Pakistan to Ireland (2007-2012). Served at the Headquarters as Section Officer (1985-1987 & 1991-1992), Director (1992-1994 & 2001-2003) and Director General (2012-2013).